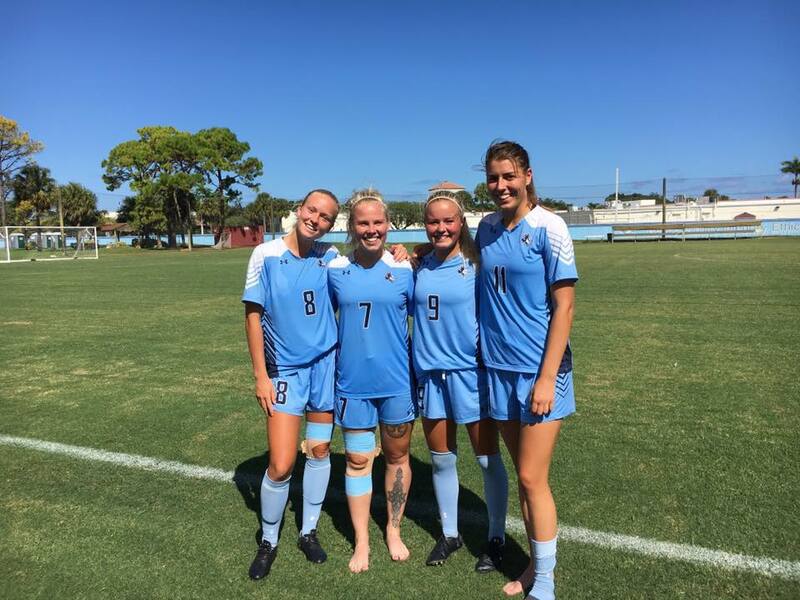 College Soccer Player Maxi Krug: "I am living my dream"
The 22-year-old from Leimbach, Germany now lives in West Palm Beach, Florida and plays college soccer for the Seahawks. After a long 2018 season and some serious knee injuries she wants to be fit again in the summer for the start of the 2019 season. Sometimes she has to pinch herself hard. Is it all just a dream or really true? Two years ago Maxi Krug made a decision. “I want to go to the US.” But not as a tourist for a week or two. The world’s leading college recruiting agency Athletes USA helped her realize the dream of her athletic future. One and a half years ago, she packed her bags, left home and started a new chapter in sunny Florida. Sporty as well as professional. 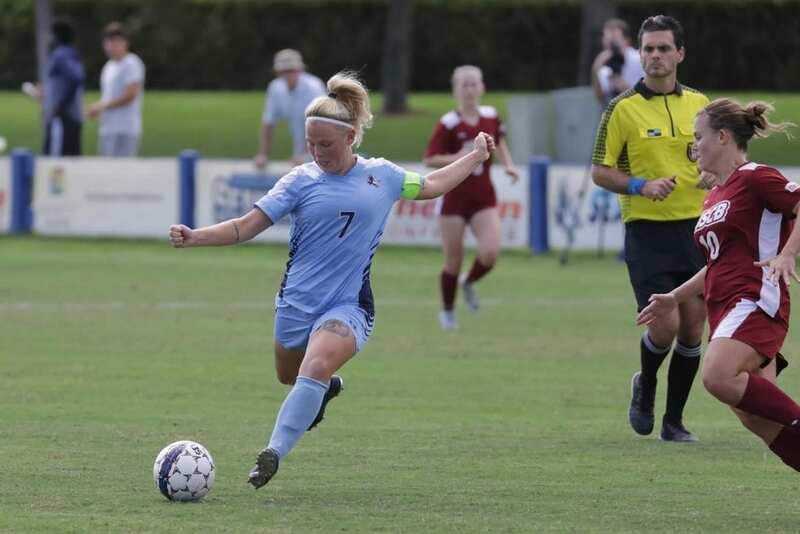 The 22-year-old studies sports science at Keiser University and swirls in the offensive midfield for the Seahawks. A few days before Christmas, somewhere in a small café, raindrops pattering against the window panes: Krug longs for this sight back into sunnier climes. “The weather is not as nice as in the US. When I left there were still around 25 degrees.” With these degrees, her home, the rural Leimbach, cannot serve in those December days. What counts in those days: the reunion with family and friends. Ten months later she is back on the pitch. The season is short, lasts around four months. It’s pretty intense for that. Likewise the preparation for it. The sweat flowed three times a day. Mainly in boot camps with debilitating fitness exercises and running tests. “Those were really tough sessions, six in 48 hours. A few tears were flowing. You feel really broken after that, but you have to overcome yourself. It pays off eventually, “said Krug. She is the only active footballer in her family. She started playing at SG Leimbach and went to the sports school in Jena with 13. Four years later she gives her three-minute Bundesliga debut for Jena on October 13, 2013 in a 3-0 win in an away game against Cloppenburg. In the summer of 2015 she left Jena and moved to Bonn near her big sister. And then the tide turned. She dared to leap across the Atlantic. Right in her first full season, her team made it to the finals of the Nationals. In the final, they came just short 0-1. “Of course that’s bitter, if you lose a close final and drive home empty-handed. But it was the first time in school history that a women’s team made it to the final.” The team: 28 young women, mostly from Europe. In her “first” season after her torn ACL Krug contributed 13 goals – a successful season, but she also ended it in pain. The inner ligament was causing problems now. “It was splinted at the last surgery. There are screws in there that are not sitting where they should be. The inside ligament is partially torn. ” The surgery in January went very well. “I hardly had any pain and could walk right away.” Not enough injuries yet, on the last MRI a fatigue fracture in the pelvis was diagnosed. She has enough time now to cure her injuries during the Spring Season. “I have agreed with the coach and physios that I will not play any friendlies in the spring instead concentrate on the rehab.” In the summer she wants to be fit for the new season. For the team. To her delight, she is no longer the only German-speaking player. Goalkeeper Nina Haeberlin came in the summer. “We needed someone for that position. I knew her because she played in Mönchengladbach and most recently for a University in Georgia. I wrote to her and tried to lure her to us,” Krug says with a smile. Both their sporting fortune is closely linked to the sports agency Athletes USA. They accompany athletes to a sports scholarship in the USA. Before that, Johanna Rappe, soccer player from Auleben, Germany, took this route. “I thought, what Johanna can do, I can do too. My decision was clear: I want to go to the USA.” Krug contacted Jonas Heidrich, ex-player of Wacker Nordhausen and agency employee. Doubt whether a move to the US two years after graduation was still possible, he quickly dispersed. Then it started – with two English tests. She had to talk, write, listen and read. To study at a US university, Krug needed a certain minimum score. “My scores were good so I had numerous options and twelve universities to choose from.” Krug chose Keiser University in the state of Florida. Not a big university, but one with feel-good character. Leaving the US, she no longer wants. “For me it was the best decision.” Although she misses things like the good German food such as Schnitzel and bread. But she does not want to miss the sun, the beach and the sea. Although she has been living her dream for one and a half years, she has to pinch herself again and again.